Working in Merchant Navy is very lucrative profession in India. Usually, former personnel of the Indian Navy opt to work with Merchant Navy upon completion of active service. Additionally, the Merchant Navy also recruits fresher graduates of various maritime training institutes for various positions. There are various positions available for veteran sailors as well as fresher in the Merchant Navy. In India, Merchant Navy jobs are broadly classified under two categories. International or Foreign Merchant Navy: This includes large cargo container carriers, oil and natural gas tankers, ore freighters, automobile carriers and many more. They ply between various countries. Domestic Merchant Navy: This means ships that ply between India’s large ports carrying an assortment of goods ranging from military hardware to crude oil, metal ore, foodstuff and lots of other stuff that is cheaper to carry by sea. However, India has a small domestic Merchant Navy. The country has an extensive railway network and hence, shipping goods by sea or through other waterways proves cumbersome and sometimes expensive. Consequently, most Indians work on international or foreign Merchant Navy. Imagine a life confined in a ship and surrounded by waters for better part of the year? You will sail through storms and rough seas frequently. Plus, there is an added threat of pirates and sometimes accidents including collision with other vessels, ramming into unseen underwater rocks and glaciers, running around for any reason and explosions. Given these risks, sailors working with Indian Navy get very lucrative salaries. But a salary is not the only factor that entices people to join Indian Navy. Crew are entitled to slew of myriad benefits and perks. And of course, the added attraction of visiting foreign countries, during port calls. If high salaries are sufficient attraction, you may consider a career with the Merchant Navy. Generally, Merchant Navy jobs are of three kinds. Here are brief indicators about Merchant Navy salaries. Merchant Navy salary mentioned in this article are purely indicative and derived from different sources in the international maritime trade. Your salary may differ, depending upon employer, nature of duties and type of Merchant Navy vessel. There are two types of jobs on Merchant Navy ships. Licensed Crew: Those who hold adequate experience and are certified by a national or international organization can take licensed jobs. Unlicensed Crew: These are motley crew required for menial tasks as assistants in every department of the ship. They do not have any specific qualifications but need certification from a national or international authority to work on ocean bound ships that ply between countries. Captains go by various names including Skipper, Master, Chief Officer and Chief Mate, among other designations. A captain is the most skilled person on board any type of Merchant Navy vessel. They have a plethora of complex duties such as managing the ship and its crew, ensuring safety of all hands on board, proper navigation and responsibility of the cargo, among others. In our era, captains become priceless hostages at the hands of pirates plying off the Somalia coast and certain regions of Far East Asia. Due to these duties and risks, the captain gets the highest salary in Merchant Navy. The captain reports directly to the company that owns the ship. Their orders on board a ship are final. According to ancient maritime traditions, a captain is not supposed to abandon a stricken ship and is expected to go down after all crew are evacuated. The tradition is now largely scrapped. The second officer reports directly to the captain. Also known as the Second Mate, this person is responsible for complex activities to support a captain’s duties. These include keeping tabs on the vessel’s routes, deciphering complex weather data available from satellites, charting alternative courses and assisting the skipper in day to day administration of the ship. The second officer usually interacts directly with team leaders of other crew and assigns them specific duties. Also among a second officer’s duties are ensuring wellbeing of all crew members, visiting crew members admitted to the sick bay for any reason, coordinating with the captain to send messages to the shipping company or vessel owner and safety of cargo. Second officers have one major task: they help resolve any disputes or issues that may arise among crew on board a vessel. Such disputes can jeopardize the cargo or wellbeing of other crew members. While trivial problems are looked after by team leaders of various departments, major issues are brought to the attention of the second officer, who solves them amicably. Duties of the Third Officer or third mate are both enjoyable and tiring. A third officer has to keep eye on technical operations of the ship including fuel position, speed, get mechanical or technical problems resolved from engineers, maintain log of works completed at the end of the day while ensuring that all safety standards on board the vessel are maintained. The third mate coordinates with navigation crew to ensure smooth sailing of the ship. Additionally, the third officer is also tasked with duties such as checking that all safety and lifesaving equipment on board is well maintained to counter emergencies. They maintain inventory of various things like tools, fuel, engine oils, foodstuffs, maintaining seamless communications between ship and port and to other vessels in the area. During port calls, the third officer hands over cargo manifest to the Port Captain, who takes temporary charge of the vessel. The third mate also looks after smooth loading and offloading of cargo from the ship. This includes proper placement of cargo containers, turning on power for reefers carrying perishable cargo, correct temperature for oil and natural gas tankers and their offloading at terminus. Deckhands are also called deck cadets. They are fresher that have graduated from a maritime academy. Deckhands are required to perform all sorts of tasks on the ship’s desk. This acquaints them with duties and responsibilities of senior officers on the deck such as Third Mate, Second Mate and Captain. Deck cadets will be busy for better part of the day. They will assist the third mate, second mate or captain in navigation, safety, reading weather reports, establishing communications, mooring and anchoring, coordinating with other crew and assisting seniors in any other work when required. Other duties of deckhands includes completing documentation for berthing at ports, offloading and loading cargo, supervision of containers, safety and security of other crew, maintenance of safety equipment and providing first aid to crew, in case of any injuries. This diverse nature of duties prepares them to assume future roles as third mate and upwards. Chief engineer or first engineer of a ship holds a rank equivalent to the captain. Hence, their salary is at par with that of a captain. A chief engineer in Merchant Navy is responsible for overall functioning of the vessel. This includes maintaining its engine, keeping tabs on fuel consumption, advising the skipper on increasing or slackening speed of the vessel based upon radar readings and overall supervision of the propulsion system and network. Additionally, chief engineers on Merchant Navy have the added responsibility of ensuring proper power generation and its supply to all parts of the ship, proper maintenance of air conditioning, navigation and communications systems and entertainment facilities on board. Any problems related to engineering- of mechanical or electrical nature- on board the ship are brought to attention of the first engineer. It is the first engineer’s duty to assign proper crew to resolve any engineering related problems at sea. The first engineer also reserves the right to declare the ship unfit for further voyage while in mid-sea, due to any technical problems and advice the captain on seeking help from nearby vessels. The second engineer leads a team of other engineers for day-to-day proper functioning of the ship during its voyage. It is a very responsible position and involves daily supervision of the engine, fuel positions, navigation, and safety of all equipment on board. The second engineer is also tasked with ensuring that all emergency systems on board a vessel are in shipshape and functioning, should need arise. Second engineers in Merchant Navy report to the captain and chief engineer, depending upon circumstances. They are supposed to inform the first engineer of any problems that may occur in the ship’s propulsion system and advice on speed and other parameters related to a voyage. They directly assign the team of junior engineers on board to perform specific tasks like repairs and maintenance of equipment. The second engineer is in charge of all safety drills carried in coordination with the captain and the first engineer. Nowadays, second engineers on board Merchant Navy vessels sailing in international and territorial waters are also responsible for maintaining environmental safety and ensure the vessel does not cause pollution of any sort. A third engineer on Merchant Navy vessel has an on-hands job: they are required to be at consoles of the ship’s propulsion system, electricity generation, maintenance of communication and navigational equipment and every other duty assigned by the second engineer, first engineer and captain. Third engineers are responsible for maintaining overall hygiene on the ship, including proper water supply in washrooms and plumbing. They are expected to run routine checks of the ship structure and frame to ensure there are no possibilities of leak. They also look after painting of the ship while at sea. On cargo freighters, the third engineer takes temperature readings of reefers to ensure that perishable goods is stored correctly and does not spoil. They relieve the second engineer by assuming the duties. Third engineers also handles various safety protocols of the ship and ensures they are properly adhered to by all crew. A forth engineer on Merchant Navy ships are in charge of logistics and supplies essential for the voyage. They receive direct instructions from the second engineer and assist the third engineer in executing duties. This is also a hands-on job that requires a lot of attention and extra effort on part of the fourth engineer. Logistical duties including keeping daily inventory of fuel, spare parts, engine oils and other essentials for smooth running of the ship. They assist the second and third engineers in maintenance of electrical, communications and navigational systems. The fourth engineer also supervises water supplies and ensures that plumbing on board the vessel is running. They handle the ship’s air conditioning and ventilation systems and deploy measures for conservation of fuel and energy. Additionally, fourth engineers have to assist the second and third engineers in maintenance of hygiene and safety standards on board a ship both at sea and during port calls. Engineering cadets on board Merchant Navy vessels are usually fresh graduates of a technical school with some course from a maritime institute. They have a fairly tough job aimed at preparing them to take higher responsibilities of fourth and third engineers. Generally, engineering cadets will be assigned repairs of engine, checking and filling oil, keeping log of fuel, assisting in sewage and garbage clearance from the ship in line with internationally accepted environmental norms and on-hands maintenance and checking of sensitive electrical, communications and navigational equipment. Diploma holders in mechanical and electrical engineering streams with qualifications from reputed maritime training institutes are taken as cadets. Logistical and support crew on board Merchant Navy ships consists of unlicensed crew. The handle all motley and menial jobs that support the Deck and Engineering sections. Additionally, they also perform every task required on board the ship. Merchant Navies worldwide have a special designation called Port Captain. This is an extremely important designation and equal to that of the Captain or First Mate. Hence, they too draw high salary but minus perks of a seafaring skipper. Port captains assume overall charge of a Merchant Navy vessel when it calls on any port. Often, these port captains can be of a different company than the one that owns or operates a ship. Upon assuming charge, the port captain is responsible for its refueling and replenishment of supplies. They also supervise loading and offloading of cargo while ensuring proper documentation is handed to port authorities. A port captain is usually a first mate that opts for a land-based job after completing several years of work as seafarer. Their duties also include helping all crew that will disembark from the ship with any immigration formalities, if needed. Port captains coordinate with ship chandlers and other ground handling agents to ensure the captain or first mate gets sufficient rest before embarking on another voyage. Another key attraction to join Indian Navy are the perks. These are somewhat similar for all crew members. Benefits from the Indian government including Non Resident Indian (NRI) status that exempts income from foreign companies of Income Tax. Special housing schemes for seafarers. 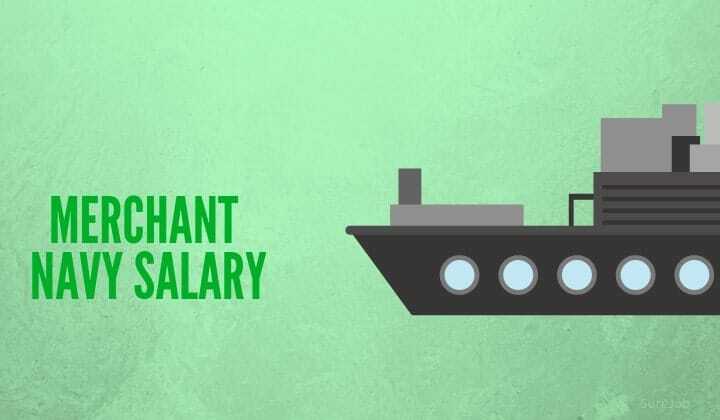 It is important to note that Indian Navy salaries and perks depend upon the employer and type of vessel you are deployed on. Salaries and perks can be higher if your voyages take you to distant lands for prolonged span of time. Merchant Navy crew also get discounted liquor and other Duty Free supplies while on port call or visiting home after a prolonged voyage. These are subject to rules and regulations in force in various Indian states. Merchant Navy salaries, as we have seen, are among the best for any profession in India. In fact, Merchant Navy salaries are far higher than those earned by airline crew, despite glamour attached to flying. However, working with Merchant Navy is not easy. It needs a lot of special skills and grit. If you find Merchant Navy salaries and perks meet your needs, join a great maritime course and join Indian navy. The salary and perks are worth your efforts. Previous articleDo you know Salary of President of India & Other Perks?